Halong Bay is the natural gift of love and the natural beauty with majestic mountains and rivers. It is a beautiful picture painted with mysterious and poetic features. The land is recognized by UNESCO as World Heritage Site and it becomes one of the tourist destinations attracting millions of visitors each year in Vietnam. If you ask any fisherman in Halong Bay, you will definitely get the answer that he prefers the fog in the morning. In fact, the day of fog is favorable occasion to catch squid. More fog, more squid. In the heavy fog day, we can almost cut it into chunk. In other days, the sky will create romantic vistas with drifting and bobbing clouds. Standing on the deck and climbing up the island, tourists will catch up the Halong beauty in the mist. Morning dew combines with the rocks, creating a white chiffon to cover the surface. Many people often compare Halong beauty to a masterpiece in the morning. 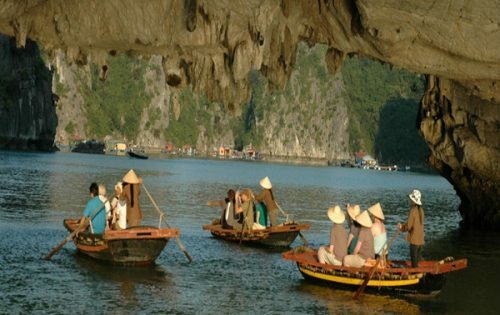 Many tourists visit Ha Long in the morning are totally impressed with the bustling in the fish village. Even it is very soon to start a new day, the daily life has begun in this “descending dragon” place. 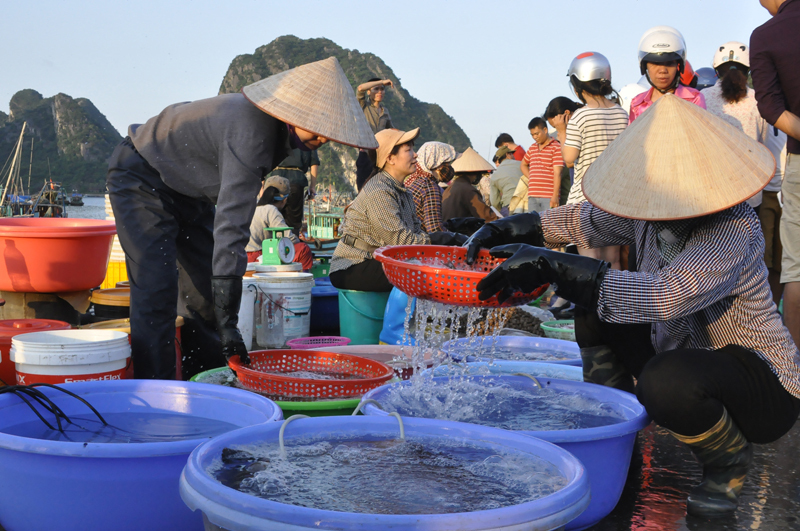 Most of the fish trades gather from 3 to 4 a.m with various kinds of seafood. After the bustling scene of buying, the market will be back to the tranquility as usual. Tourist can get up early to watch the romantic dawn in the beach with the loved one or buy seafood as gift for the family members. As a suggestion goes, Halong in the morning will be more attractive when it has drizzle, covering with fog. 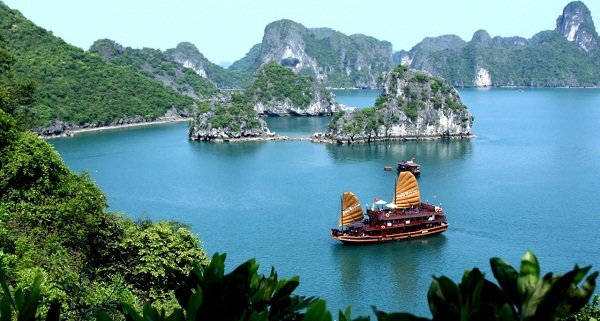 As a matter of fact, many people will mention to Halong Bay as one of the new 7 natural wonders in the world. But this is not the only destination to attract tourists when they want to spend time traveling this coastal city in an early morning of a beautiful day. 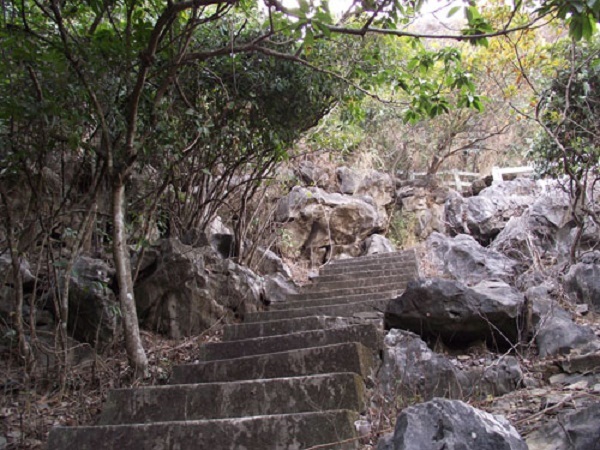 Recently, a well-known place for both domestic and foreign travelers at Halong Bay, Quang Ninh is Bai Tho (Poem) Mountain. Bai Tho Mountain is a symbol in Quang Ninh province, with historical legend. It came in 1468 on the occasion of King Le Thanh Tong, in his patrol to the northeast coast, he stopped the boat at the foot of the mountain to enjoy the scenery and carved a natural high poetry on the cliff from which they are called here the Bai Tho mountain. This is not the highest mountain in the city but it has the ideal position for you to admire the panoramic view of Ha Long Bay from above. Due to the influence of the tropical monsoon climate, Halong Bay as well as many other areas in the North has much fog in the late of the year, lasting for most of the spring. Therefore, this problem causes humidity, moisture, limiting visibility of travelers and tourists. 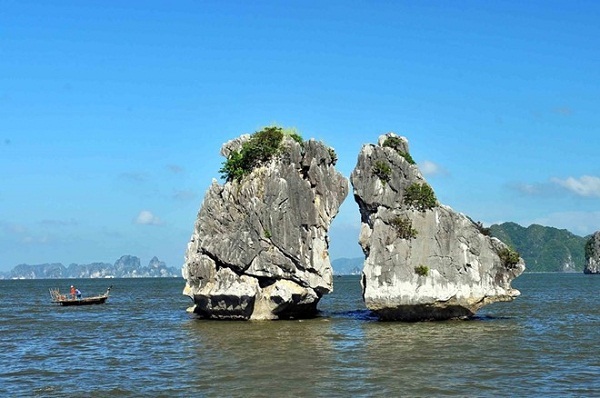 It is a significant feature of Halong in the morning that tourists should be aware of. Especially, in these days, it also makes dense traffic on the bay boats with many difficulties, even potential risks of accidents. However, in a different perspective, the fog also made deals with the unique, poetic beauty.